Northwestern provides access to Microsoft Windows and Microsoft Office software through an volume licensing agreement with the vendor. To use Windows or Office on a departmental computer, users must activate the software through a Volume Activation (VA) process. This process uses a Key Management Service (KMS) host that each computer will need to access via the Northwestern network periodically to validate. Once successfully activated through a connection to the KMS, periodic reauthorization should occur in the background and users should not have to manually process activation requests to the KMS host. If you get an error that states "No OEM license found", it may require a BIOS update to support volume upgrade activations. Business Units and Departments may need to add the 'northwestern.edu' and 'ads.northwestern.edu' DNS suffix to a client host's network adaptor found under TCP/IP properties to resolve the DNS lookup and allow for the KMS activation. Almost all KMS issues on computers outside the ADS domain (for example, Feinberg and Kellogg machines) are caused by the DNS suffix being absent. To avoid issues with KMS activation, make sure to take these steps before you start the activation process. Click the Start Menu and search for Network and Sharing Center. In the top right corner, click Change Adapter Settings. Right click the active network (wireless, wired, or VPN) and click Properties. In the Networking tab, double-click Internet Protocol Version 4 (TCP/IPv4). In the General tab, click Advanced at the bottom. In the DNS tab, find the DNS suffix for this connection: box. Type northwestern.edu into this box, then click OK.
Click OK to exit both open settings menus. Open the Command Prompt via "Run As Administrator". Right-click on Command Prompt in the start menu to bring up the option. If the machine cannot resolve the connection, ensure that the DNS suffixes are set up correctly (see above). If the DNS suffixes are set up correctly and the client still cannot resolve the KMS host address, you may need to install Telnet Client (not installed by default) on Windows 7 to verify the client can access port 1688 on the KMS host. Once you are sure the machine can connect to the KMS host, proceed with the instructions below for activation. Please reference the Volume Activation Troubleshooting Guide and Volume Activation Error Codes list to troubleshoot other KMS errors. To check the KMS Activation status within the Windows 7 client, click the Start Menu. Right-click on Computer, then click Properties. The activation status will be listed at the bottom of page under Windows activation. Reboot the computer and check to see if the activation was successful. To check the KMS Activation status of the Office 2010 client, open any Office program (Word, Excel, etc.) and click the File tab. Click the Help option. The activation status will be listed above the About section. 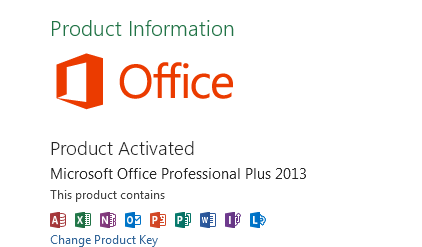 To check the KMS Activation status of the Office 2013 client, open any Office program (Word, Excel, etc.) and click the File tab. Click the Account option. The activation status will be listed to the right in the Product Information section. 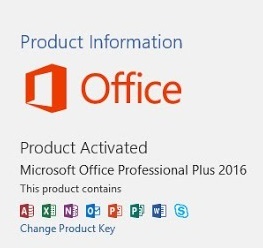 To check the KMS Activation status of the Office 2016 client, open any Office program (Word, Excel, etc.) and click the File tab. In operation, the KMS client attempts to contact a KMS host on startup and again every Activation Interval minutes upon failure. By default, this happens every two hours. When KMS activation succeeds, the client receives and stores the KMS host's Renewal Interval, and Windows activates for 180 days. Activation renewal operates as a sliding window, similar to a DHCP lease. The client is activated for 180 days but still attempts reactivation every Renewal Interval minutes-by default, 7 days. If it succeeds, the 180-day period is reset. If it fails, the system will watch for network changes or other qualifying events to trigger another attempt. After 15 minutes, the system stops monitoring for qualifying events but still attempts every Activation Interval minutes. If 180 days passes without successful reactivation, the client transitions into Out of Tolerance (OOT) Grace. If it does not activate within 30 days of transitioning to OOT, it falls into Notification mode. Notification mode notifies the user that the client is using unlicensed software. Once the KMS client sees the KMS host, the notifications are no longer received. Volume licensed software in notification mode, does not lose any functionality.